FIG. 10.10.3 Multiple-hearth incinerator fuel consumption as a function of moisture content in the feed and percentage of volatile solids. Notes. 1. 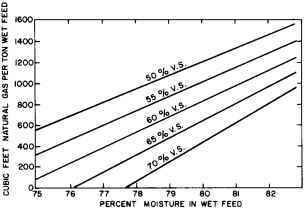 Curves are not applicable for feed rates below 4 tn per hr. 2. Curves do not include allowance for lime as a filter aid. 3. To correct for lime, downgrade volatile solids according to lime dosage. Assuming lime forms calcium hydroxide, each pound of CaO forms 1.32 lb calcium hydroxide. 4. Natural gas calorific value is assumed to be 100 Btu per cu ft. 5. Heat content of sludge is based on 10,000 Btu per lb of volatile solids. 6. %V.S. represents percentage of volatile solids in the feed. 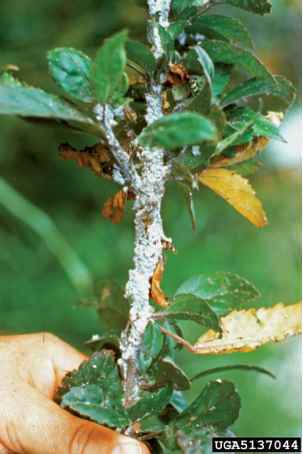 zinc or chromium, it can damage certain crops although it does not damage cereals or grass (Sebastian 1974b). The harmful effects are more likely to occur in acidic soils and can be offset by the addition of lime to the sludge. The main advantages of multiple-hearth incinerators include their long life and low operating and maintenance costs (Sebastian 1974b); their ability to handle sludges with a moisture content of up to 75% without requiring auxiliary fuel; their ability to incinerate or pyrolize hard-to-handle substances, such as scum or grease; their ability to reclaim chemical additives, such as lime in combination with or separately from incinerating the sludge; and their flexibility, in that they can be operated intermittently or continuously at varying feed rates and exit-gas temperatures (Sebastian 1974b). The auxiliary fuel requirement varies with the dry-solids content of the sludge and with the percentage of volatiles in the solids (see Figure 10.10.3).